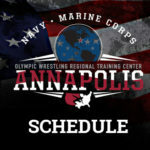 April 26-28 USA Wrestling, US. Open Championship Las Vegas, NV. USA Wrestling, UWW Championship (20Under) Las Vegas, NV. May 19-21 USA Wrestling Last Chance World Team Qualifier Rochester, MN.